Duarte is the lead curator of ZAPANTERA NEGRA, in collaboration with Rigo 23, Emory Douglas and Mia Eve Rollow. Zapantera Negra united Zapatistas (EZLN) with Black Panther Party esthetics to investigate the use of the body and visual culture in both distinct political and artistic movements. 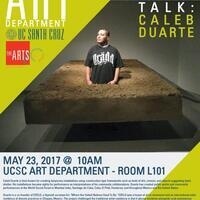 Duarte is currently artist in residence at La Pena Center in Berkeley, CA, through the Doris Duke Charitable Foundation. He is working with Central American unaccompanied minors currently applying for asylum.